← Are You as Attuned to RFID Technology as You Should Be? TV Viewership for “March Madness” (the NCAA Men’s Basketball Tournament) includes both serious sports fans and casual watchers — and millions of people who are participating in a bracket pool to see who wins their pool. 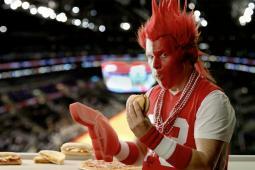 7-Eleven is one of several advertisers who run special promotions during March Madness. This entry was posted in Part 1: Overview/Planning, Part 2: Ownership, Strategy Mix, Online, Nontraditional, Part 3: Targeting Customers and Gathering Information, Part 6: Merchandise Management and Pricing, Part 7: Communicating with the Customer and tagged 7-Eleven, advertising, experiential retailing, March Madness, merchandising, opportunity, promotion, sports marketing, TV commercial. Bookmark the permalink.